Junk makeover show. 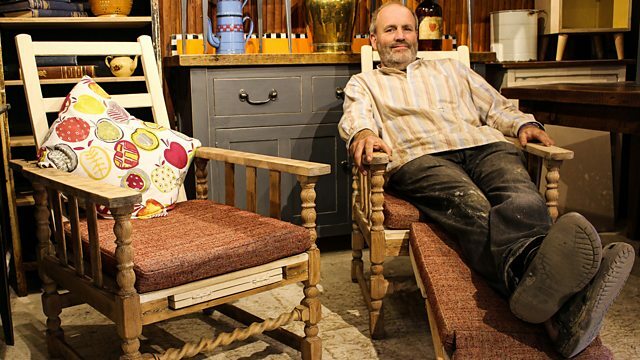 Upcycling expert Sarah Moore is in Surrey where she finds some tired chairs, a collection of fishing rods and a reproduction designer chair. Upcycling expert Sarah Moore searches for three items that have the potential to produce a profit at the Witley Recycling Centre in Surrey. With her salvaged items under her arm, Sarah enlists woodworker Norman Wilkinson to tackle some chairs in need of a makeover, while creative duo Josh and Oli have the unusual task of reimagining a collection of fishing rods. A reproduction designer chair has Sarah scratching her head, but will she succeed in making money for nothing?